This name is one of great interest to Wilson researchers. The first reference to the Langloh name is in the passenger manifesto of the sailing ship Skelton as she sailed from Leith. On board as fellow passengers of Bonnie William and Margaret are Frederick and Mrs Langloh – the list unfortunately does not state her firstname, but as you will see below this was discovered via later research. Captain Dixon lists them in his book on the voyage to VDL but spells their name ‘Langlou’ – an error that occurs in other places too. But their correct name was Langloh. He also erroneously lists Frederick as Frank – several other records of their arrival on the Skelton refer correctly to his name as Frederick. We do not know whether the two families were known to one another before embarking on the Skelton. One legendary story was that Langloh was a solicitor from Carnoustie, a small settlement along the coast from Barry in Angus, but his employment after reaching Van Diemens Land does not seem to support this idea. We know William and Margaret were in Carnoustie prior to their marriage and emigration in 1820; given the apparent personal/family tensions associated with their marriage and emigration we wonder might there have been at least a professional support relationship between William and Frederick, if not already a personal friendship or one which emerged at the time. Circumstantial indications are they were very close friends. ‘Langloh’ appears several times, as a middle name in one of William and Margaret Wilson’s children and for some of their grandchildren. Whatever the relationship the Langloh’s had with Bonnie William and Margaret it must have become a close one for the name to be so used. Information so far uncovered on the Langlohs in Australia and England, and just who they might have been is detailed in the attached ‘Who were the Langlohs ?’ – this includes an excerpt from the publication ‘Hamilton – The Way to the West’ which alludes to the Langlohs, their unsuccessful farming endeavours in that district (in Tasmania) and the district’s retention of the Langloh name. Frederick was granted a sizeable area of farmland near the town of Hamilton north of Hobart; it was over 2000 acres indicating that Frederick was pretty well endowed financially when he arrived in Hobart. His property shown on the map above he named Langloh Park, and the name Langloh is still used for the area today. 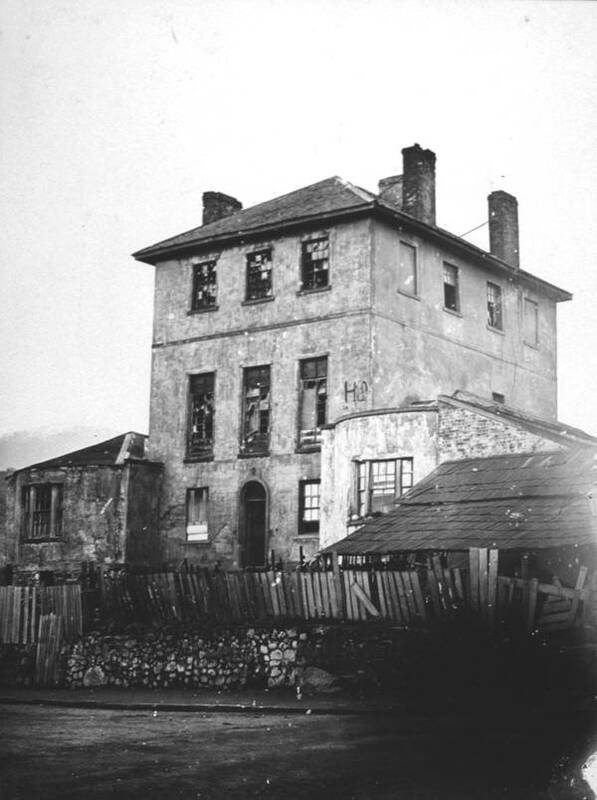 In addition to this land the family had a substantial town residence in Davey Street Hobart (image shown here, courtesy of the Tasmanian Museum). That home was demolished during the early 20th century. Unfortunately Frederick lost his property to his creditors during the severe drought and depression of the early 1820s (that depression seems to have paralleled one in England which followed the termination of war with the French). That region of Tasmania was to become well known as particularly exposed during drought periods, a fact not known by the first settlers of the region. It seems Frederick did have sufficient capital remaining to set up and operate a liquor retail business in New Norfolk whilst also retaining his Hobart home. However he died in 1826. His wife Mary remarried to Richard Chelton a few years later. Subsequently to the early research in the ‘Who were the Langlohs’ document, we came across the name Langloh in a lady, ‘Catherine Langloh Parker’, the wife of a well to do grazier living on a sheep station in the late 19th/early 20th centuries called Bangate Station in far northwest NSW, a hundred Km or so from Walgett. Catherine became quite a noted scholar in Aboriginal culture and wrote several books on dreamtime and related tribal legendary stories; her books are widely referenced today by students of indigenous culture. We attach below a descendants chart showing the Parker family; this includes Mary Langloh nee Parker who was married to Frederick Langloh, and who after Frederick’s death married Richard Chelton. Catherine Langloh Parker died in 1940 in Adelaide. A copy of her story is appended below with relevant paragraphs highlighted in yellow.